In 1910, prominent bankers and government officials convened a secret meeting on a stunning South Georgia key known as Jekyll Island. Gathering at a place that was once a haven for French privateers and, later, a playground for the rich of the Gilded Age, the group devised the plans that would result, three years later, in the creation of the Federal Reserve System, America's central bank. Almost exactly a century later, in May 2009, some 30 "freedom keepers" — men who, like most members of the radical right, despise the Fed and see it as part of a plot to exploit American citizens — came together at the scene of the "crime" to wash away its sins. 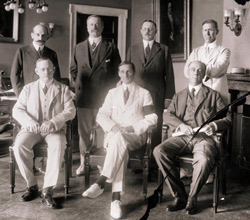 Meeting in the Federal Reserve Room of the luxurious Jekyll Island Club, they held an elaborate ceremony meant to symbolically "supplant the secretive deliberations" of 1910. Hoisted over the club as they met was the Gadsden Flag, with its coiled snake and cantankerous slogan, "Don't Tread on Me." Convened by long-time radical tax protester Bob Schulz, who has been attacking the Fed and the Internal Revenue Service for decades, this remarkable gathering appears to have played a key role in launching the current resurgence of militias and the larger antigovernment "Patriot" movement. Less than five months into the Obama Administration, the Jekyll Island conclave warned of "increasing national instability," worried about a coming "New World Order," denounced secret schemes to merge Canada, Mexico and the United States, and furiously attacked the new president's "socialized" policies and failure to end illegal immigration. A gathering in 1910 on Jekyll Island produced plans for the creation of the Federal Reserve System. "The Feds are out of control," Jon Roland, one of the participants and a Texas militia leader of the 1990s, told the Intelligence Report. They "have actually been engaging in warlike activity against the American people. … It kills people." One of the most remarkable things about the little-noticed Jekyll Island gathering, which in some ways resembled another meeting that helped launch the militia movement of the 1990s, is how it brought together disparate elements of the radical right. It included radical tax protesters, militiamen, nativist extremists, anti-Obama "birthers," hard-line libertarians, conspiracy-minded Patriots with theories about secret government concentration camps, even a raging anti-Semite named Edgar Steele. Others, representing gun-rights absolutists and the far-right "unregistered churches" movement, were invited but sent their regrets. That's not all. In addition to producing a whole series of "action plans to confront the violations" of the Obama Administration, the Jekyll Island meeting led to a number of other radical cooperative efforts. Most remarkably — and most recently — more than 100 delegates from 48 states traveled to St. Charles, Ill., in November to attend an 11-day "continental congress" planned at Jekyll Island and hosted by Schulz's organization, We the People (WTP). Given that it took its name from the gathering that was the first step toward the American Revolution, it isn't surprising that attendees felt, as one told a Pennsylvania newspaper just before the congress began, that it was "the final step before we have no other options." Robert L. Schulz is no stranger to the radical right. For decades, he has battled the federal government over his right to sell products claiming that the income tax is illegal and Americans need not pay it. He has been behind more than 100 court actions and petitions claiming government malfeasance and seeking various forms of redress. He has run full-page ads in national newspapers calling attention to his groundless theories. In 2008, Schulz and his We the People Foundation were found in contempt of court for refusing to turn over lists of people who had bought his materials. Over the years, Schulz has made friends in low places; a wide variety of extremists, including Holocaust deniers, have attended his events. Since 2008, Schulz also has become a vocal "birther," one of those who, against all the evidence, claim President Obama is not a U.S. citizen. In two full-page ads in the Chicago Tribune that year, Schulz demanded that Obama either bring him proof that he is "a natural born citizen" or be called out as a "usurper" to whom the armed forces "would be under no obligation to remain obedient." But it was only last year that Schulz began to play a key role in building a larger movement, one with concerns that went far beyond challenging the legality of taxes and Obama's holding the office of president. At Jekyll Island, there were long hours spent discussing a list of alleged ongoing constitutional violations that will soon "collapse the Republic." The dark talk focused on fears of illegal surveillance, gun-control laws, "transportation choke points," sustainable development, and "individual and state sovereignty." And there was angry talk, of course, about taxes and "unconstitutional fiat currency," meaning, in English, the U.S. dollar. There were many other long-time enthusiasts of militias and related Patriot organizations there, too: John Stadtmiller, who once ran militia promoter Mark "Mark from Michigan" Koernke's radio show, and now heads the far-right Republic Broadcasting Network; Tom DeWeese, a co-founder in 1997 of United Truckers Defending the Constitution and an angry critic, like most on the radical right, of the United Nations; Ernest Hancock, a libertarian radio show host who in the 1990s ran the Patriot-friendly group Second Amendment is for Everyone and also the website Viper Reserves, which defended members of the Viper Militia arrested in 1996 and later imprisoned on serious federal conspiracy and weapons charges; Paul Venable, head of the Idaho chapter of the anti-immigrant and anti-abortion Constitution Party; and Roland, who founded the Texas Militia Correspondence Committee in 1995. According to the Jekyll Island Project website, there were many newer members of the radical right present as well. They included Robert Crooks, leader of the virulent California nativist group Mountain Minuteman, who in 2007 concocted a faked video enthusiastically depicting the killing by snipers of undocumented immigrants crossing the border. ("This video shows how to keep a Home Depot parking lot empty," Crooks wrote in a mass E-mail attached to the video.) Lt. Cmdr. Eric Cunningham was there from Oath Keepers, a Patriot group formed last year, composed of military and law enforcement officers, and given to antigovernment conspiracy theories. Also present was Edgar Steele, who represented the neo-Nazi Aryan Nations in a 2000 lawsuit brought by the Southern Poverty Law Center and has since become an ardent anti-Semite himself. (In 2002, in an essay entitled "It's the Jews, Stupid!!! ", Steele wrote, "Jews are the problem. Jews have been the problem since before they saw to the crucifixion of Jesus Christ.") And there was an official of Restore the Republic, the Patriot group that released a film last fall alleging that the Federal Emergency Management Agency is constructing a network of concentration camps meant for patriotic Americans. Schulz responded to some E-mail questions from the Intelligence Report but he was careful in those questions he chose to answer. Asked if the Georgia meeting had reawakened the Patriot movement that produced so much havoc in the 1990s, he replied: "There appear to be more individuals and organizations waking up to the importance of the Constitution" and critically examining government actions. G. Edward Griffin, who helped organize the Jekyll Island gathering, may have been more revealing. Griffin, who wrote a scathing 1994 attack on the Fed published by the anti-communist John Birch Society and also a sympathetic biography of the group's founder, was the first to speak at the meeting. He told conferees that merely putting "large numbers of people in the street" was not enough. "We must," he said, "achieve power." In the aftermath of the Jekyll Island meeting, We the People activists helped to inject a radical note into "town hall" meetings held around the country by various politicians last summer to discuss a public health care option and other matters. In August, William Kostric, identified as a member of WTP's Arizona chapter, showed up at a health care reform meeting hosted in New Hampshire by President Obama. Kostric was wearing a gun strapped to his thigh and carrying a sign reading, "IT IS TIME TO WATER THE TREE OF LIBERTY" (a reference to Thomas Jefferson's statement that the "tree of liberty" needs occasional refreshing with "the blood of patriots and tyrants"). According to press reports, Kostric, who did not respond to requests for comment, had a MySpace page filled with paeans to militia groups and Randy Weaver, a white supremacist hero of many militiamen. That same month, Chris Broughton, also listed as a member of WTP's Arizona chapter, brought an assault rifle to an Obama town hall meeting in Phoenix, provoking something of a media storm. While there, he was interviewed by Ernest Hancock, the militia sympathizer who also attended the Jekyll Island summit. A day earlier, Broughton had attended a fiery sermon by Tempe pastor Steven Anderson, who reportedly prayed for "Obama to melt like a snail tonight" because he was a "socialist devil, murderer, infanticide." Anderson told reporters he regularly prayed for the president's death and that Broughton was part of his congregation. Schulz has also been reaching out to other antigovernment groups. In October, his WTP held a joint event with the Oath Keepers, which suggests on its website that government roundups and concentration camps are imminent dangers. The event in Chatham, N.Y., was dedicated to helping Americans become "aware of the threats to their individual freedoms and liberties, as well as to their nation's sovereignty." By last November, the American radical right was growing increasingly agitated. Patriot groups, according to the Southern Poverty Law Center's count, had exploded over the prior year. The "tea parties," while not strictly speaking extremist groups, were shot through with radical ideas and conspiracy theories. Nativist groups were booming. And anger at Obama, even in the political mainstream, was swelling, fueled by accusations of creeping socialism. It was a good time, in other words, for Bob Schulz. When his WTP organization finally threw its "continental congress" in Illinois, it drew delegates from around the nation. And those delegates represented an even wider swath of the American radical right than had been represented at the Jekyll Island conclave. Now, there were neo-Confederate secessionists, "common-law court" enthusiasts, and adherents of the "sovereign citizens" movement, in addition to the militia backers and other radicals who had been at Jekyll Island. Kevin Tebedo, who "testified" in 1995 to the Colorado Common Law Grand Jury, one of the pseudo-legal peoples' "courts" that populated the Patriot movement of the 1990s, was there. (Tebedo later led the anti-gay group, Colorado for Family Values.) So was William Reil, who was arrested in Pennsylvania in 1998 for having a homemade license plate and driver's license — typical of those in the so-called sovereign citizens movement. Reil used various "paper terrorism" tactics in an attempt to get his car back, including filing a document that demanded the arrest and impeachment of the governor. Reil declined to make any comment. Dan Gonzales, a former Southeast Florida leader of the neo-secessionist League of the South — a white supremacist hate group whose leader has said that the South needs to be returned to "general European cultural hegemony" — was on hand. Gonzales, too, declined to discuss his past or the Illinois meeting. In the end, the St. Charles congress issued a genuinely radical document entitled "Articles of Freedom." It declares that the federal government "now threatens our Life, Liberty and Property through usurpations of the Constitution" and calls for 11 different actions. It demands Obama produce his birth documents and blames immigrants for putting the nation "at risk of terrorism, crime, and disease." It calls for repealing all social service spending, denounces "a cartel of private banks," demands a currency alternative to the dollar, and insists on the end of taxation. It rejects all supranational bodies, including the non-existent North American Union (the entity that nativist conspiracy theorists claim is being secretly planned by Mexico, Canada and the United States). Taking a page from the sovereign citizens movement, it demands an end to driver's licenses, auto registration and insurance. Rejecting the existing legal system, it calls for the creation of "randomly empanelled citizens' common law grand juries" to determine when a trial will take place. And, like the anti-Semitic hard-liners of the Posse Comitatus in the 1980s, it asks that Americans treat county sheriffs as the highest legitimate police authority. The ranks of We the People have burgeoned since the November congress, and they now include dozens of prominent radical-right figures. Among them are Orly Taitz, the California dentist on a personal jihad to prove that Obama is not a citizen; Cory Burnell, a former leader of the white supremacist League of the South and later founder of Christian Exodus, which seeks a theocratic takeover of the state of South Carolina; John Hassey, former leader of the Central Alabama Militia; Walter Burien, co-founder in the 1990s of the Arizona Sons and Daughters of Liberty militia; and Jo Ann Dingley, once a contact for the Santa Rosa County Militia and a delegate to the Third Continental Congress, a Patriot formation. Wayne Gunwall, who in the 1990s traveled around the country helping groups set up common-law courts. He was sentenced to 15 months in prison in 1997 for conspiring to impede and harass Internal Revenue Service agents. Arthur Hollowell, a "sovereign citizen" who in 1982 was convicted of forgery charges and then was a fugitive for years. He was eventually sentenced to a year in federal prison in 1997 after pleading guilty to running a scam, called the Northwest Community Exchange, to hide millions of dollars from the Internal Revenue Service. In the 1990s, Hollowell was tied to the Citizens Bar Association, which urged tax resistance and was reportedly anti-Semitic. Robert B. Beale, convicted of tax evasion in 2008 after two years on the run. And David Eugene Landess, who accepted a plea bargain in 2009 on felony charges of attempting to evade taxes over several years. It's not clear what role Bob Schulz and We the People will play in the coming months and years. What is certain is that they have had a key, and little-noticed, part in the dramatic expansion of the radical right over the last year. It may well be, when the history of these years on the radical right in America is finally written, that the Jekyll Island summit, and the continental congress that followed, did more than any other effort to build the muscle of the radical antigovernment movement. And that, judging by documents produced at the group's November congress, may well presage new dangers for the American public. The documents conclude that any infringement on the people's liberty as laid out in the Constitution is "an act of WAR" that "the People and their Militias have the Right and Duty to repel." Janet Smith contributed to this report.